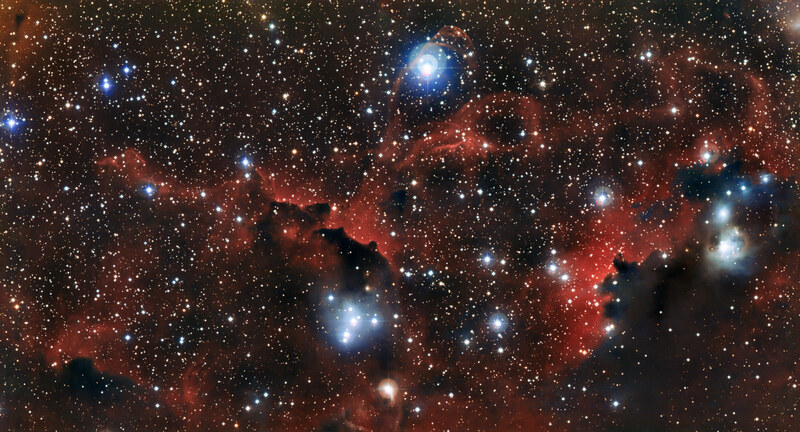 Captured by the 2.2-metre telescope at ESO’s La Silla Observatory in Chile, this new image shows a section of the Seagull Nebula, also known as IC 2177. The reddish hue in this image is a telltale sign of the presence of ionized hydrogen . The Seagull Nebula, known more formally as IC 2177, is a complex object with a bird-like shape that is made up of three large clouds of gas — Sharpless 2-292 (eso1237) forms the “head”, this new image shows part of Sharpless 2-296, which comprises the large “wings”, and Sharpless 2-297 is a small, knotty addition to the tip of the gull’s right “wing” . These objects are all entries in the Sharpless nebula catalog, a list of over 300 glowing clouds of gas compiled by American astronomer Stewart Sharpless in the 1950s. Before he published this catalogue Sharpless was a graduate student at the Yerkes Observatory near Chicago, USA, where he and his colleagues published observational work that helped to show that the Milky Way is a spiral galaxy with vast, curved arms. Astronomers use the term HII to mean ionized hydrogen and HI for atomic hydrogen. A hydrogen atom consists of an electron bound to a proton but in an ionized gas atoms are split into freely moving electrons and positive ions, in this case just single protons. Be the first to comment on "The Seagull Nebula and its Cloud of Dust and Glowing Gas"